Sensitive and reproducible pharmacokinetic (PK) and immune response (IR) assays are required as part of the complex and lengthy development process for biotherapeutic proteins. These assays are included in a range of approaches applied to understand the nature and properties of the drug as well as the induction of anti-drug antibodies (ADA), which can cause adverse events and loss of efficacy. 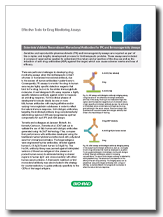 There are particular challenges to developing drug monitoring assays when the biotherapeutic is itself a human or humanized monoclonal antibody, due to the excess of human antibodies in patient serum. Consequently, PK assays to monitor the drug in human sera require highly specific detection reagents that bind to the drug, but not to the similar immunoglobulin molecules. 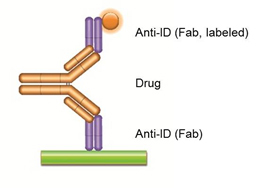 A well-designed IR assay requires a highly specific reference antibody against which to measure an anti-drug response, and for the clinical phases of development it should ideally be one or more fully human antibodies with varying affinities and/or varying immunoglobulin subclasses in order to reflect the natural immune response. 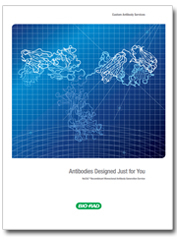 Anti-idiotypic antibodies, targeting the individual antibody drug complementarity determining regions (CDR) are recognized as optimal components for such PK and IR assays. Tornetta and colleagues at Janssen Biotech Inc., formerly Centocor, (Tornetta et al., 2007) set out to validate the use of fully-human phage-derived anti-idiotypic antibodies generated using the recombinant HuCAL® antibody library, and compare their performance with antibodies developed using the traditional murine hybridoma method and with polyclonal sera from immunized primates. The target antigens were engineered human antibodies, directed against human IL-13 (IgG1/λ) and human IL-6 (IgG1/κ). The HuCAL library was panned against biotinylated versions of these two antigens in the presence of pooled human serum to eliminate binding to shared regions in human IgG1 and cross-reactivity with other human serum proteins. A framework matched control monoclonal antibody was also included in the strategy for counter-selection to guide antibody specificity to the CDRs of the target antigens. Using the same or two different anti-idiotypic antibodies (anti-IDs) in this assay, the drug to be measured bridges the capture and the detection reagents due to its bivalent nature. A highly specific anti-idiotypic antibody (purple, Fab antibody) is immobilized at low concentration and captures the drug (gold antibody) in the serum sample. The bound drug is then quantified with a second labeled anti-idiotypic antibody that binds to the free idiotope of the drug. In this assay the anti-idiotypic antibody is used as a surrogate for anti-drug antibodies that might be developed by a patient. The drug (gold antibody) is immobilized, and the anti-idiotypic antibody (blue IgG antibody) is added in increasing concentrations. The bound anti-idiotypic antibody is detected by adding labeled drug. The response curve depends on the affinity of the anti-drug antibody. The bridging assay can be established using anti-idiotypic antibodies with a range of affinities as well as different immunoglobulin subclasses to reflect the natural immune response. The Fab antibodies generated were tested in capture and detection ELISAs and antigen competition assays to assess their suitability as reagents for PK studies. The best capture and detection Fab antibodies were identified and used to establish highly specific sandwich ELISAs for both target antibodies (Figure 1a). The affinities of the Fab antibodies, determined from measurement of the association and dissociation rate constants, were between 0.08 and 6.5nM. If needed, the affinity of the HuCAL Fab could be further increased by affinity maturation to enhance the sensitivity of PK assays. For the anti-human IL-13 project, selected anti-idiotypic Fab antibodies were converted into a fully human IgG format in order to evaluate their potential as surrogate ADAs in an immune response assay (Figure 1b). IR bridging ELISA assays were developed comparing the phage-derived antibodies, mouse monoclonal antibodies and monkey polyclonal serum. The experiments confirmed specificity of the phage-derived antibodies to the CDRs and no binding to endogenous human serum antibodies and proteins. The phage-derived antibodies more closely mimicked the performance of the primate anti-human immune serum in bridging ELISA assays than the murine anti-idiotypic antibodies, which gave misleading results attributed to cross-reactivity with other human immunoglobulins in the sample matrix. Moreover, having a fully human reference antibody already available at the preclinical stage of development confers the added advantage of not having to revalidate assays with different reagents at the clinical development stage. In the researchers hands the panel of fully-human, anti-idiotypic antibodies satisfied the necessary criteria for highly specific reagents for their preclinical and clinical assays. In particular, for the IR assays, the in vitro produced antibodies overcame the limitations of antibodies derived using the traditional method of murine hybridoma generation, with the added benefit of a secure, consistent and long-term supply.